Hi there! Hannah, from Fanciful Spaces here! I am CRAZY excited to share this card with you! Ever since I successfully used whole coffee beans in my fall coffee blog hop card I’ve been obsessed with shaker cards! I have a million ideas of what I can stick inside a shaker card! Today I’m bringing you one with candy corn! To make it even better, the shaker portion can be seen both on the inside and the outside of the card! Isn’t it stink’n cute?!?!?!?! 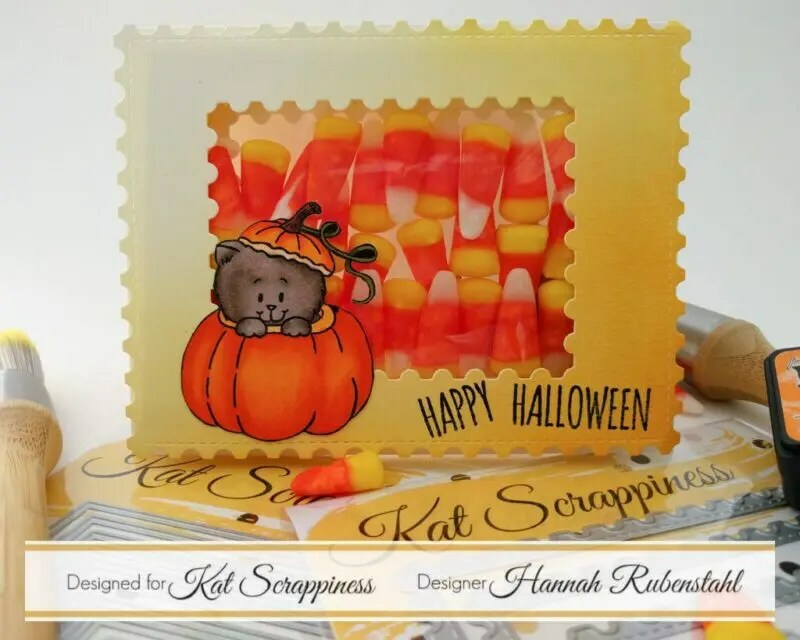 It wasn’t much harder to make than a regular shaker card, I did have to make duplicates of the postage die frame and of the cat in the pumpkin, and I had to cut an opening in my card base. But really, it wasn’t very hard. I started by cutting two A2 (5.5″ x 4.25″) sized panels out of my Neenah Solar White 80lb cardstock, using my Clarity Stencil Brushes I dusted Mustard Seed and Spiced Marmalade Distress Inks in a gradient from corner-to-corner. Then, creating a frame with the Stitched Postage Stamp Rectangular Dies by Kat Scrappiness, and some washi tape, I cut those two pieces. 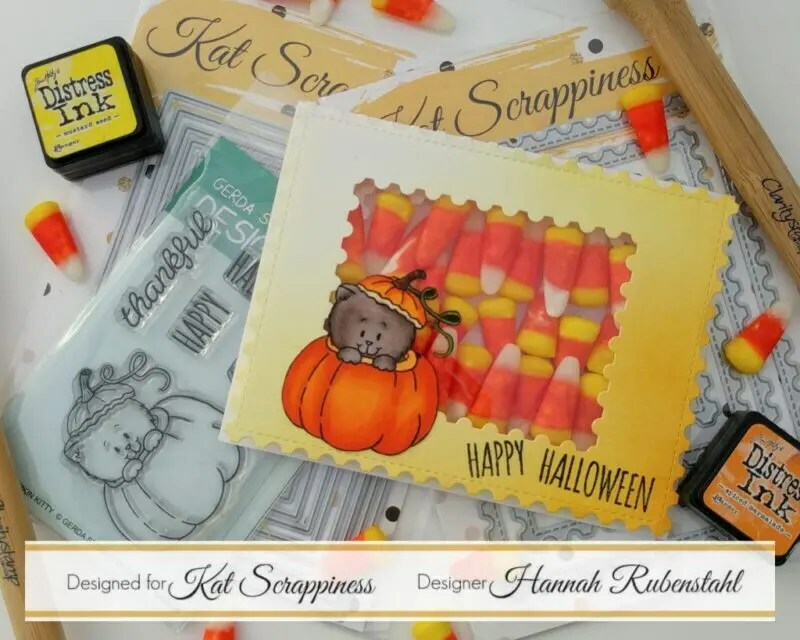 I stamped my sentiment on one piece, using the Peekin’ Pumpkin Kitty stamp set by Gerda Steiner Designs and my Memento Tuxedo Black Ink. 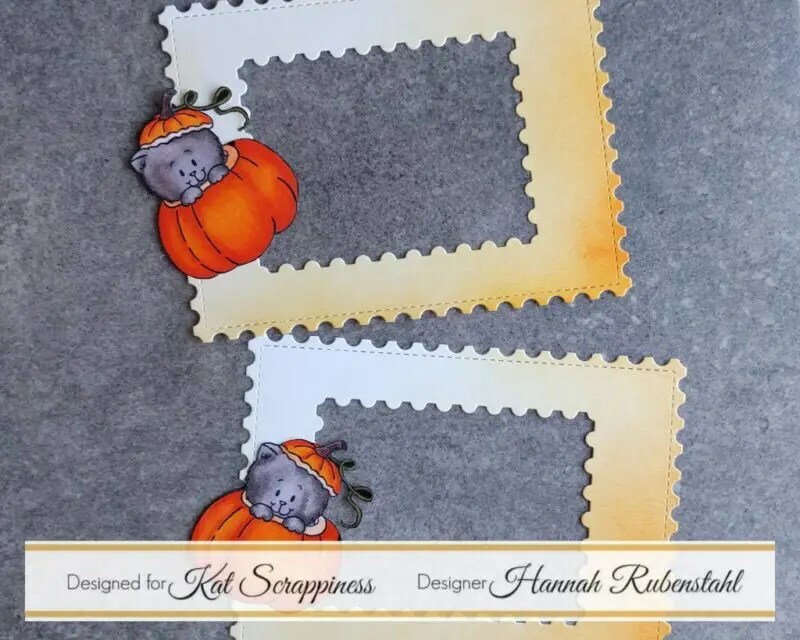 Using the same ink, I stamped out the pumpkin/kitty stamp, twice, into some more Neenah Solar White cardstock. I colored this with Copic Markers and then fussy cut it. 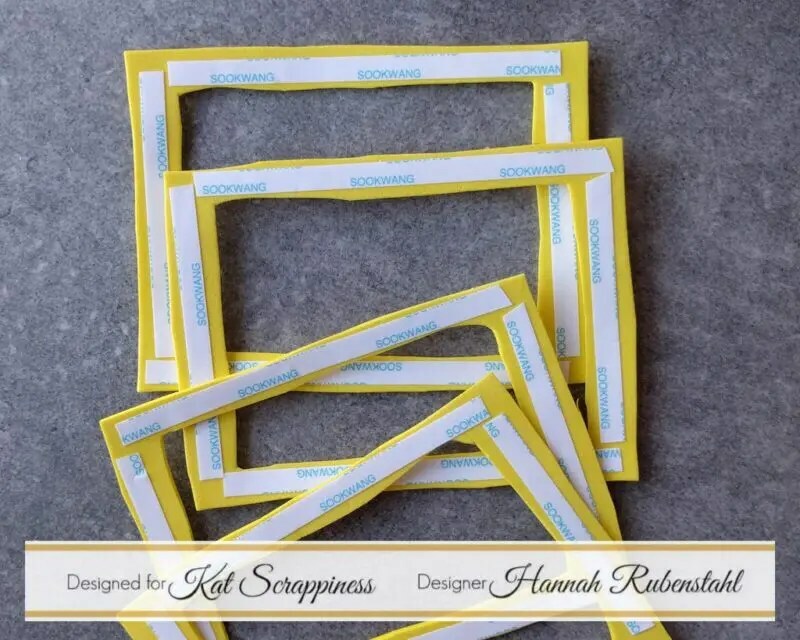 I took my card base, which was Neenah Solar White 110lb cardstock and cut a rectangle opening using the Never Ending Rectangle Dies, also by Kat Scrappiness. On the inside, I used my tape runner to adhere a piece of acetate down, and then the colored frame I had made without the sentiment stamped on it. On the front side, I taped a 4 sheet thick frame I built up using fun foam and Scor-Tape. 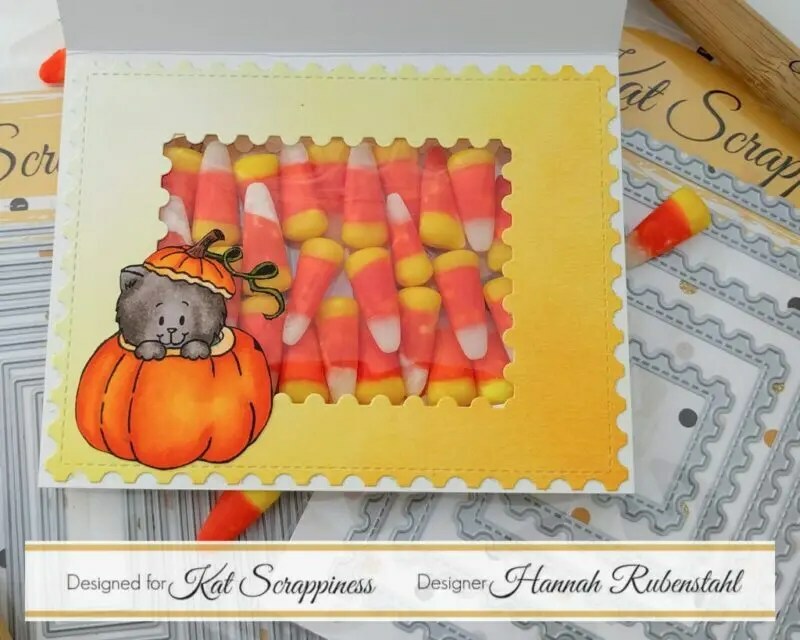 If you are re-creating this card you will have to double check the thickness of your foam with the thickness of your candy corn, both are possibly going to be thicker or thinner than mine. Basically, I wanted my frame to be just as thick as the candy corn was and no thicker. This frame was taped on using more Scor-Tape and then I laid my candy corn inside. 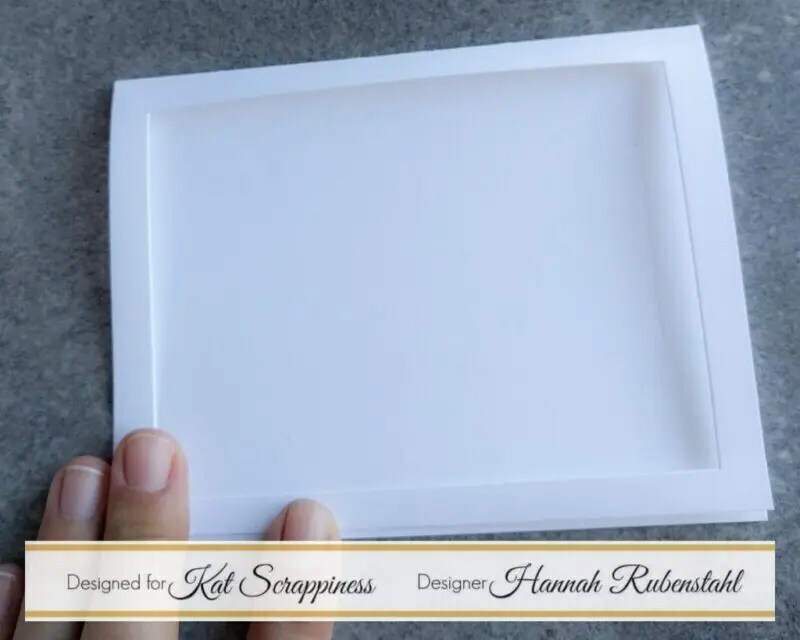 The next idea was that next I was going to carefully place my card base on top the frame, however, in the video, this is when things went awry. I accidentally adhered the frame on upside down. This was a problem because my sentiment was on wrong! WOOPS! So I had to cut it off of the card base, create a new card base and frame, and layer that on. The result was that this card is a touch thicker than it needs to be, but it really isn’t noticeable with all the other thickness in this card. At the end of the day, my goof wasn’t noticeable at all! Once my card front was properly placed on my card base I just used some Ranger Multi-Medium Matte to adhere the Copic pumpkins to both the front and the inside! If you’d like to watch how I made it, watch this video! The following is a list of the products I used, you can save 10% on your order by using my discount code Hannah10! Wow ! This is a really cool shaker card idea !